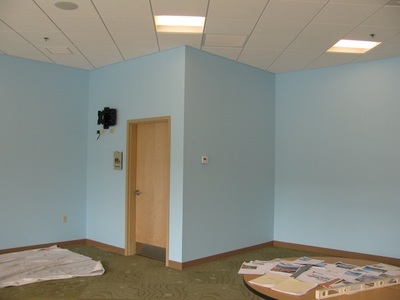 The following case studies show how Colleen's work has transformed spaces into welcoming, warm and healing environments. 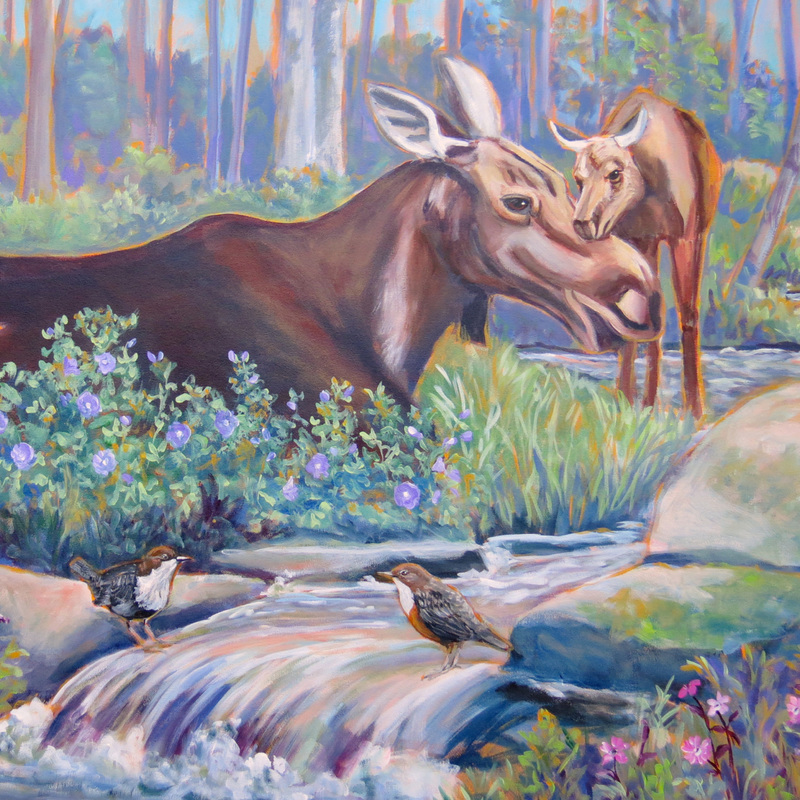 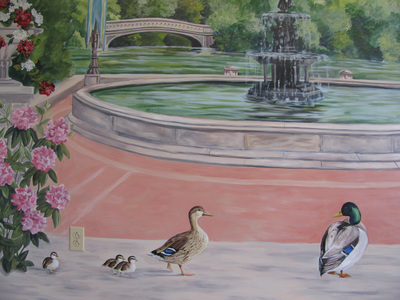 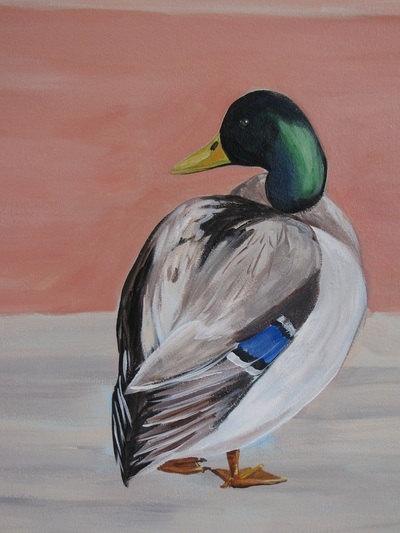 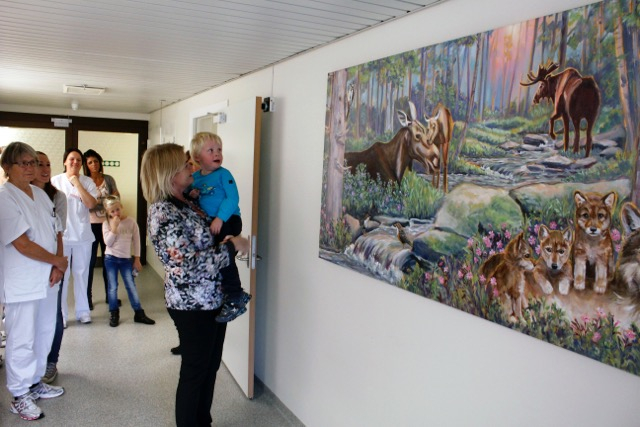 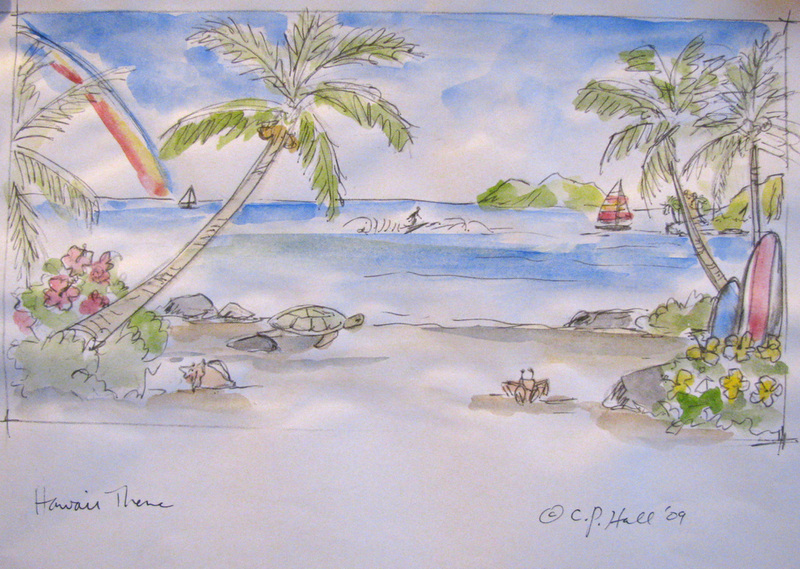 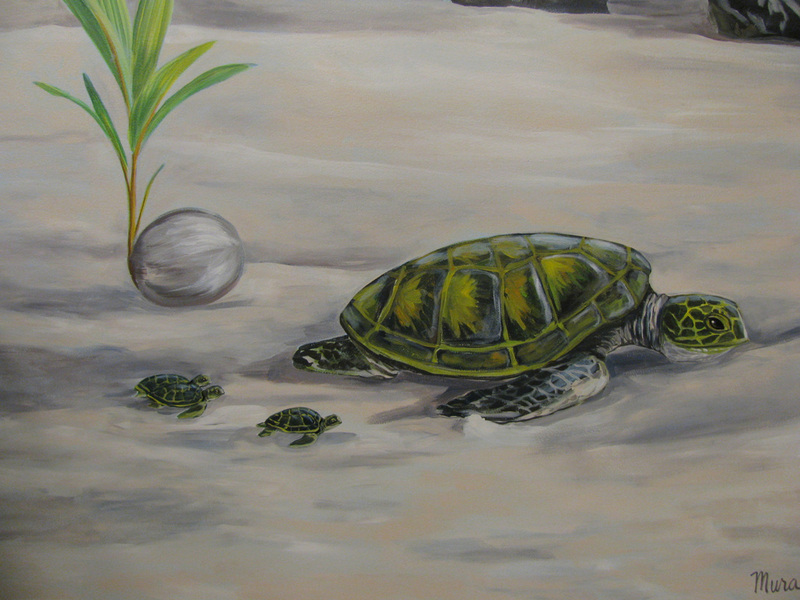 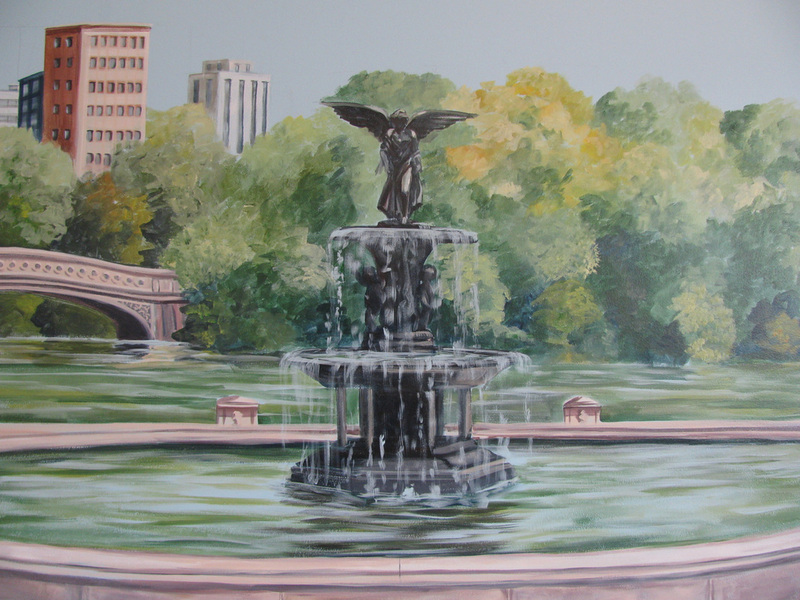 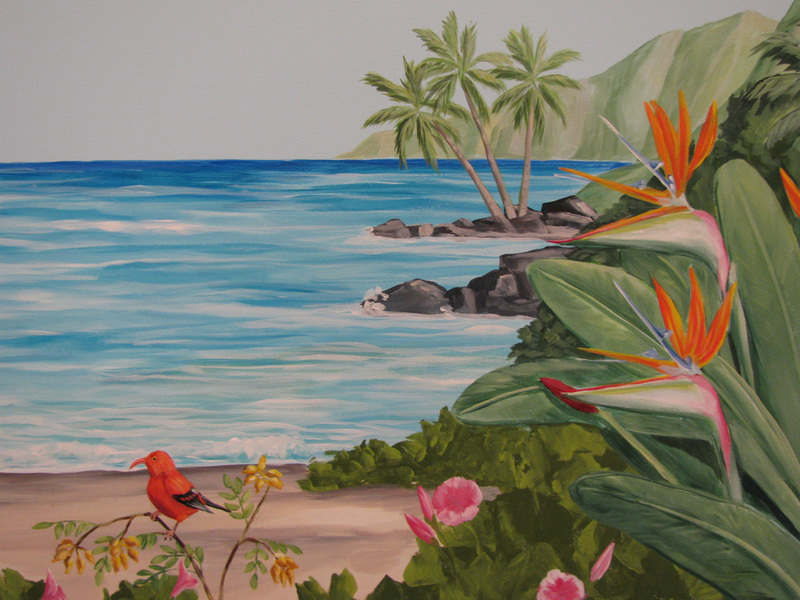 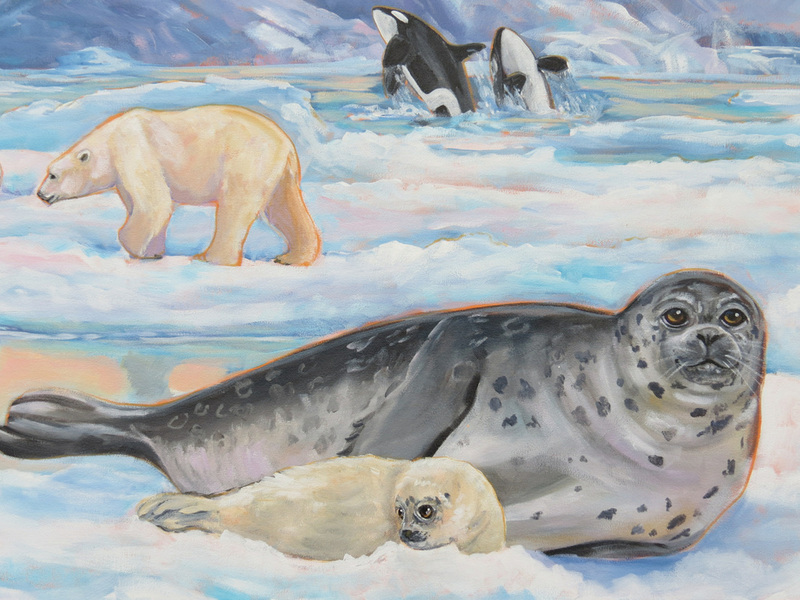 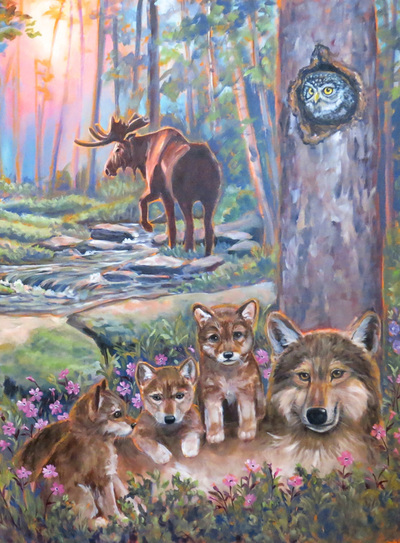 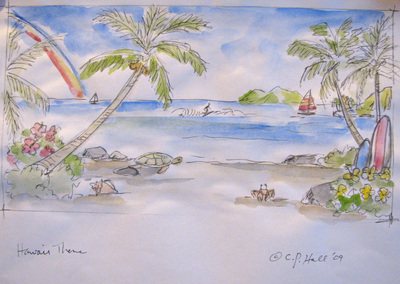 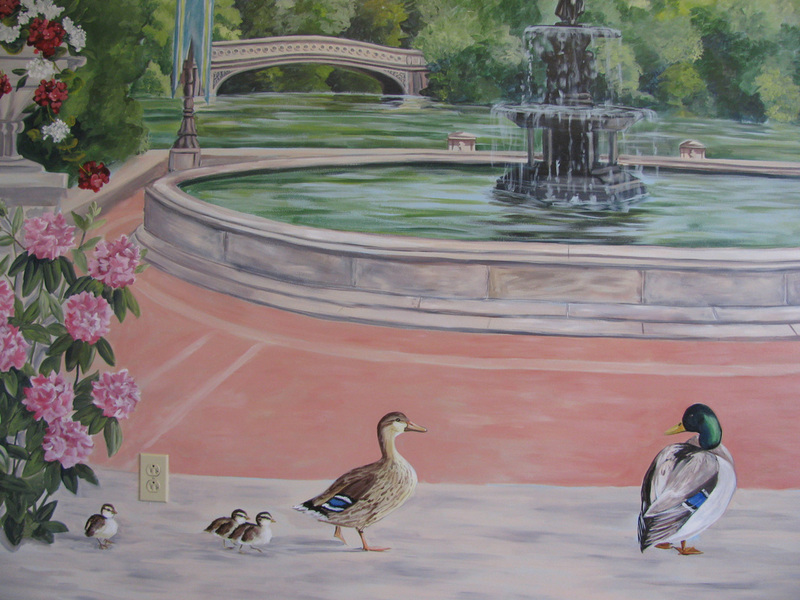 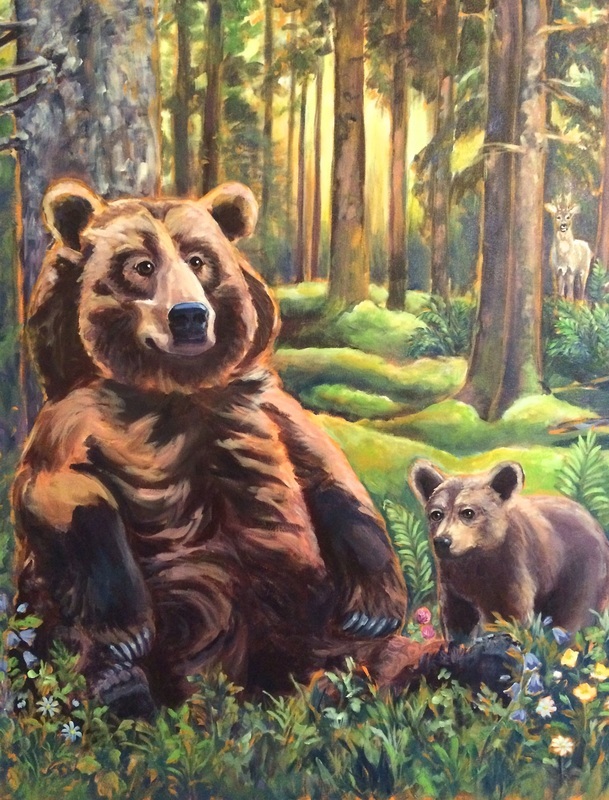 While she has specialized in Pediatric environments, her artwork appeals to people of all ages including serene environments designed for Assisted Living and Memory Care units. 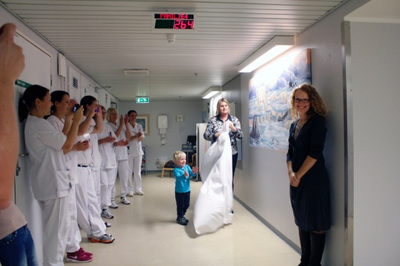 When a baby arrives 8 weeks early, no parent is emotionally prepared. 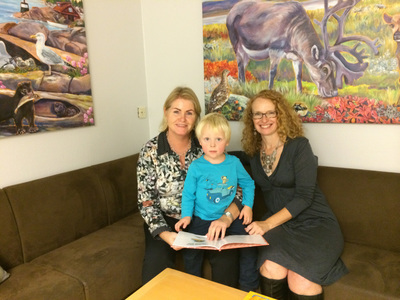 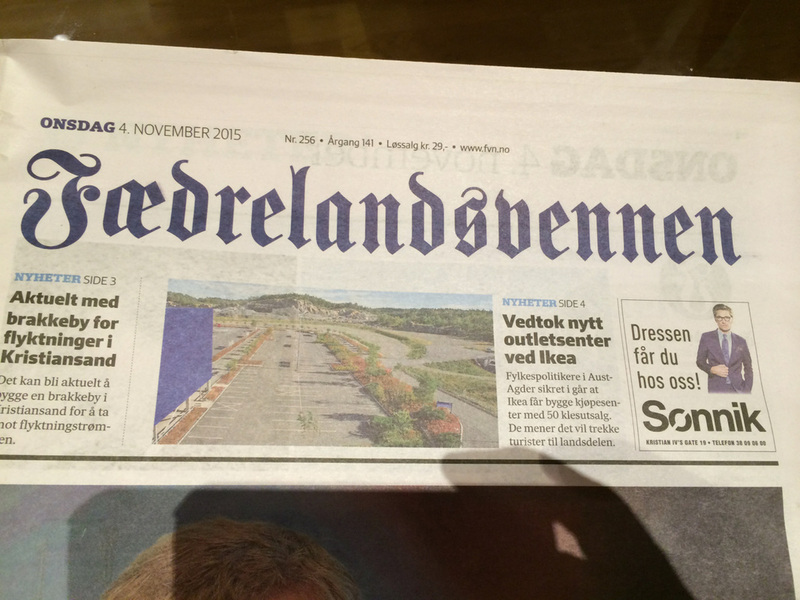 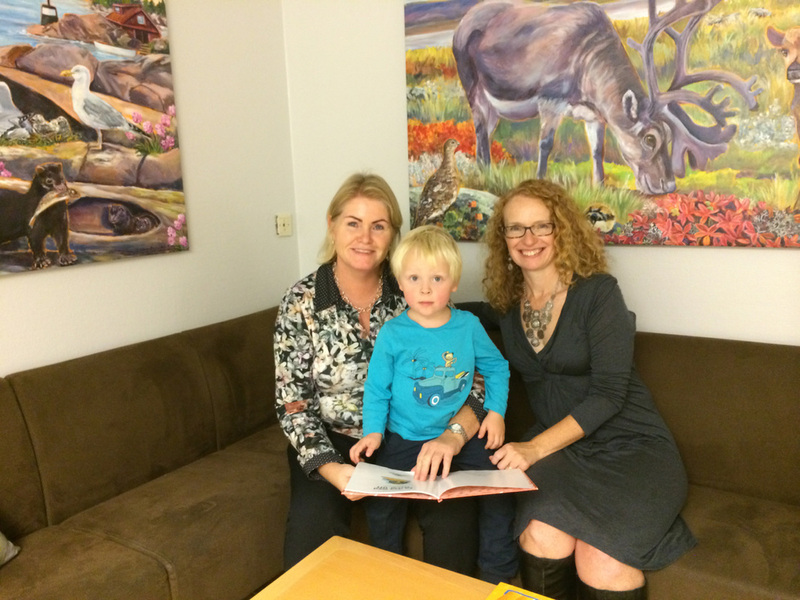 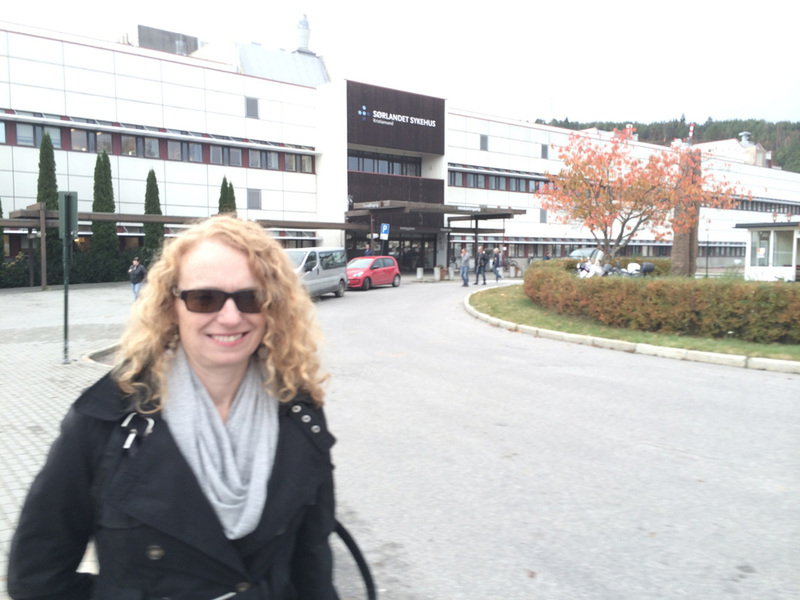 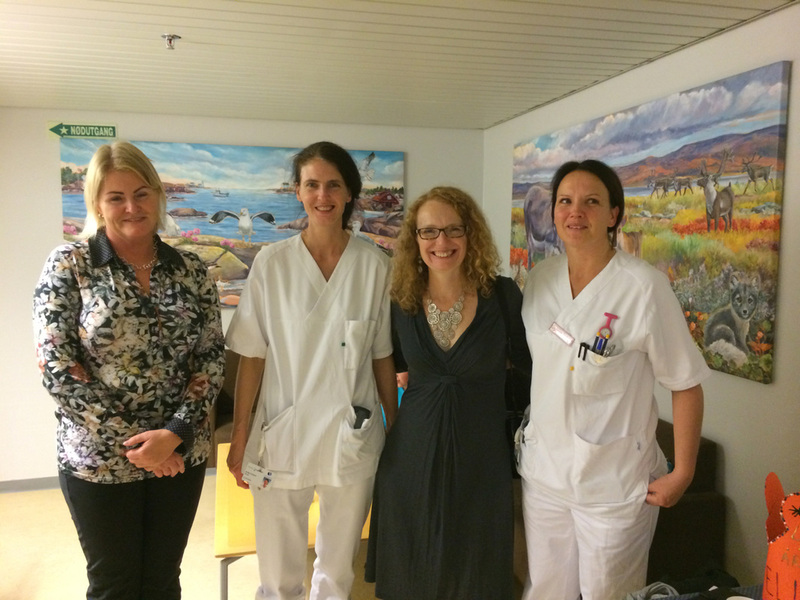 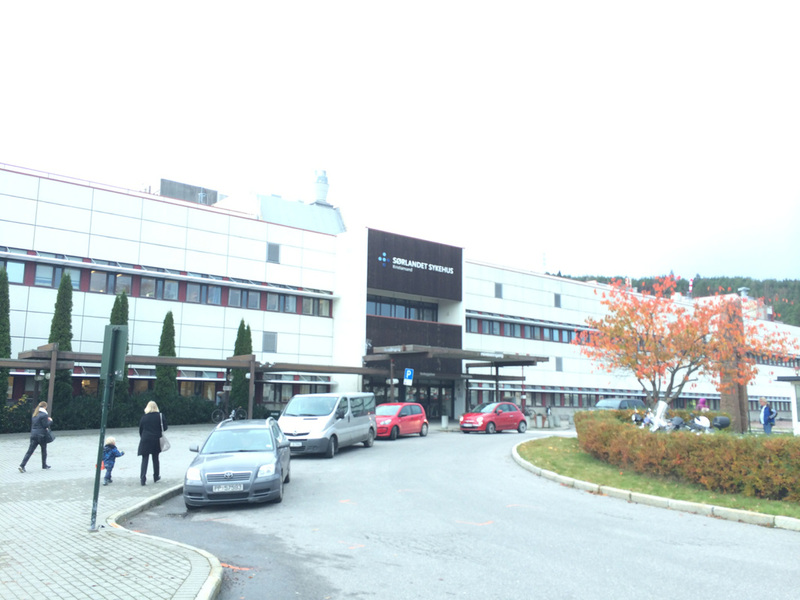 Happily for Colleen's client, the Premature Baby Unit at Sørlandet Hospital was indeed prepared. 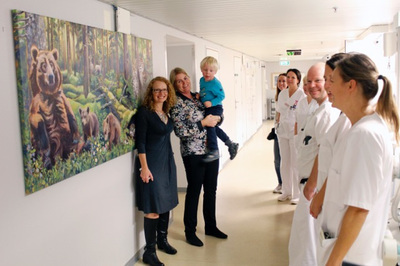 The excellent care for my client and her son, Elias, lead her to want to give something back to the doctors and nurses. 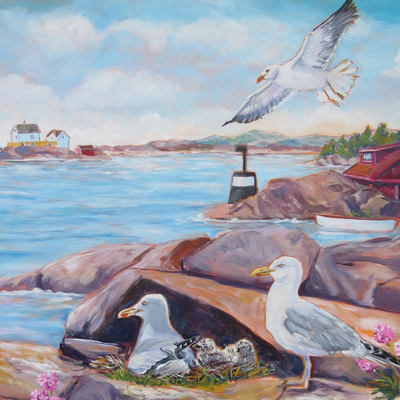 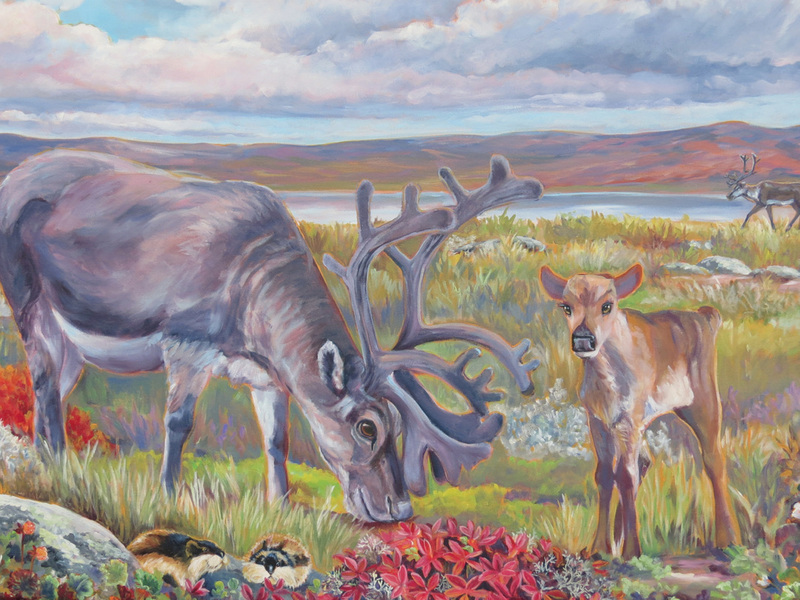 To replace a few posters and donated work, I highlighted the wildlife and unique natural environments within the country of Norway. 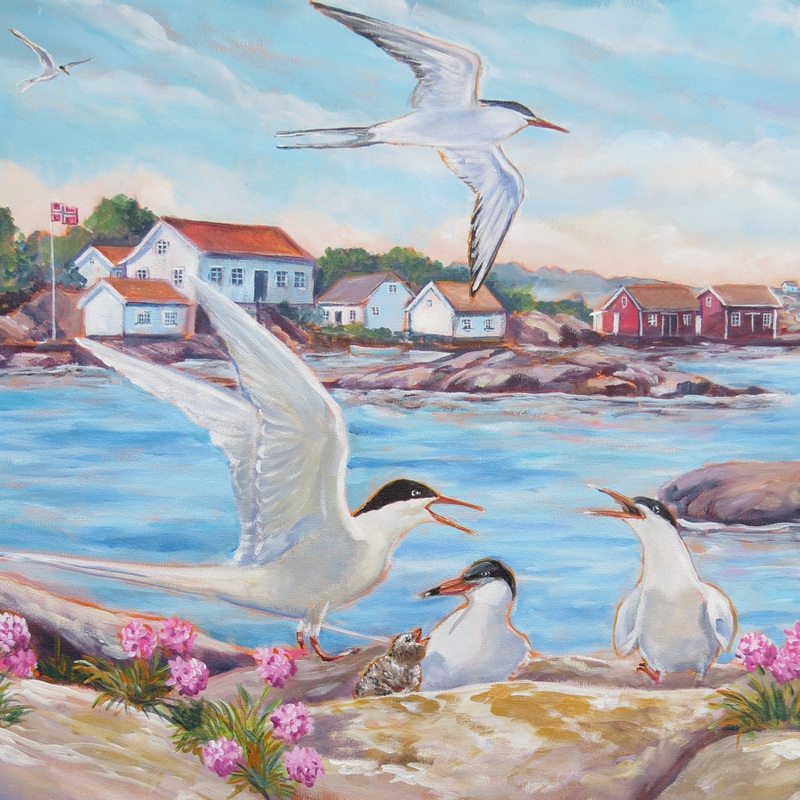 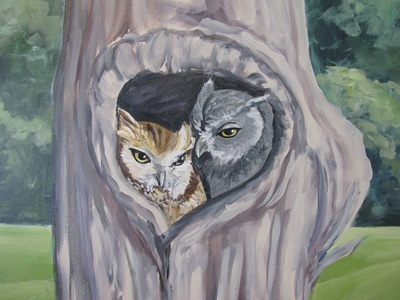 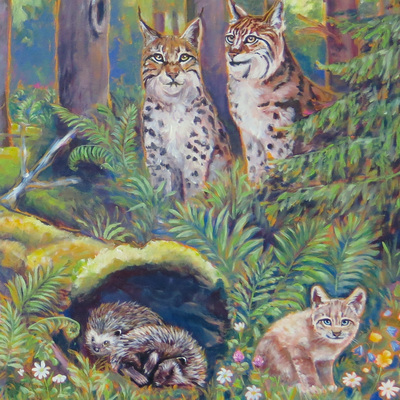 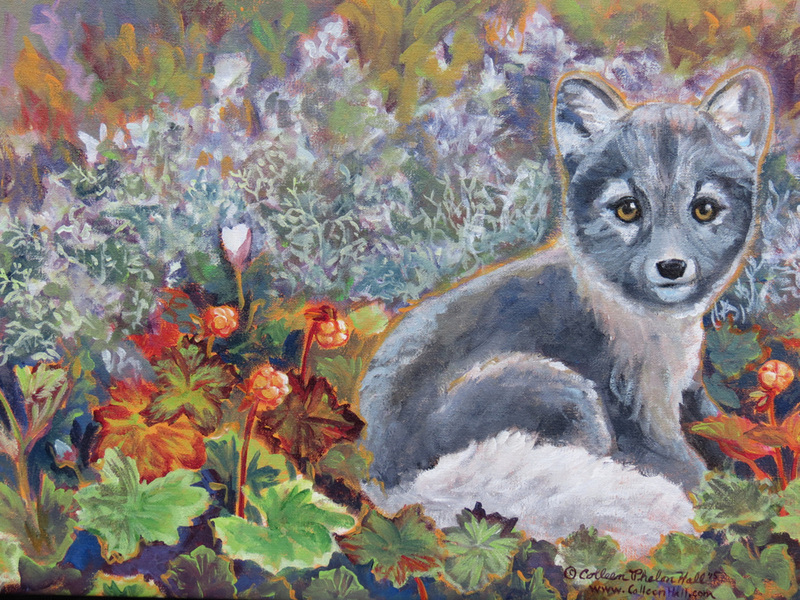 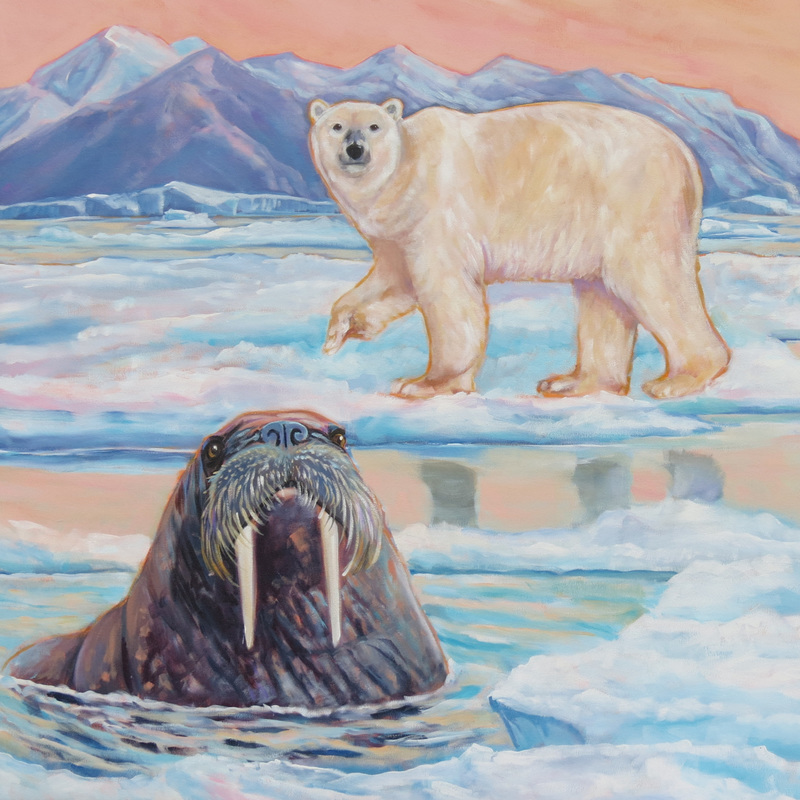 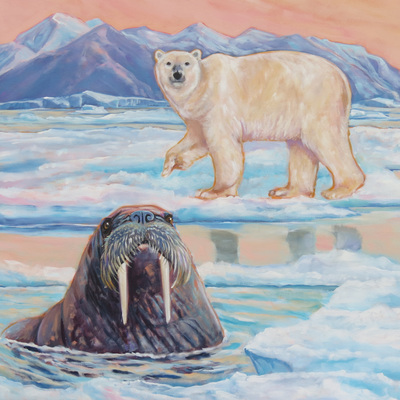 After careful research, Colleen came up with scenes that focused on the unique quality of light and wildlife in each region including coastal areas, forests, tundra and even the remote arctic regions. The scenes focused on maternal nurturing were painted on canvas in her studio and transported them with her to Norway for installation. 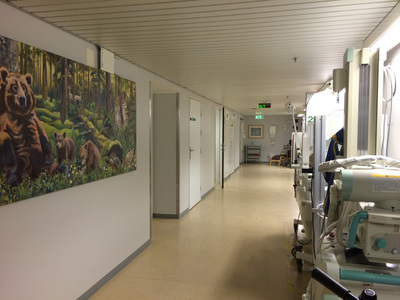 Now the walls exhibit the same kind of warmth and care that the wonderful doctors and nurses provide each day. 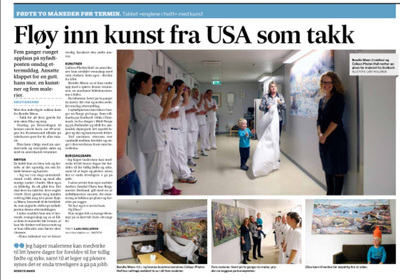 The project received a lovely article from local media and was received very well by patients, their families and the super staff. 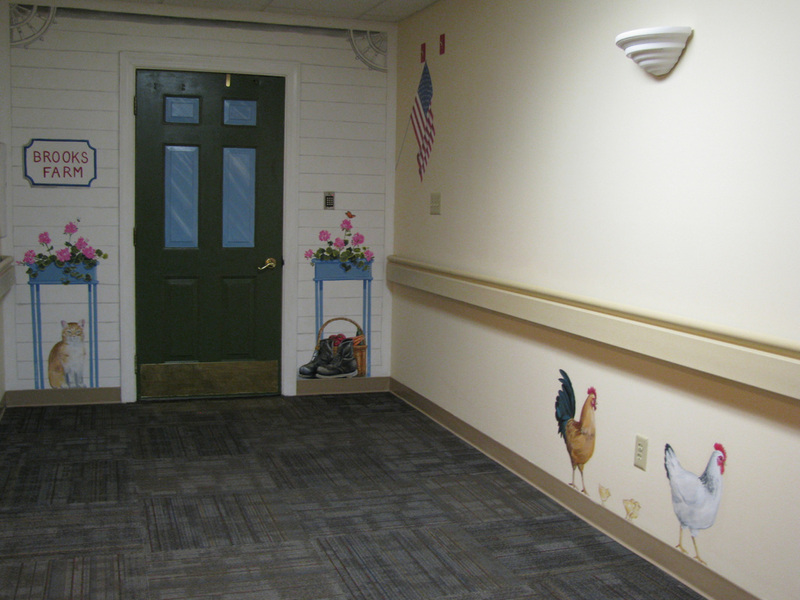 The directors of Heritage Green Assisted Living were looking for a way to create a peaceful and familiar environment for residents of their Memory Care unit. 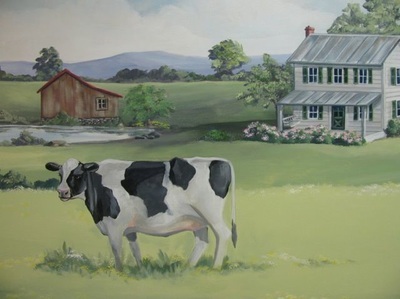 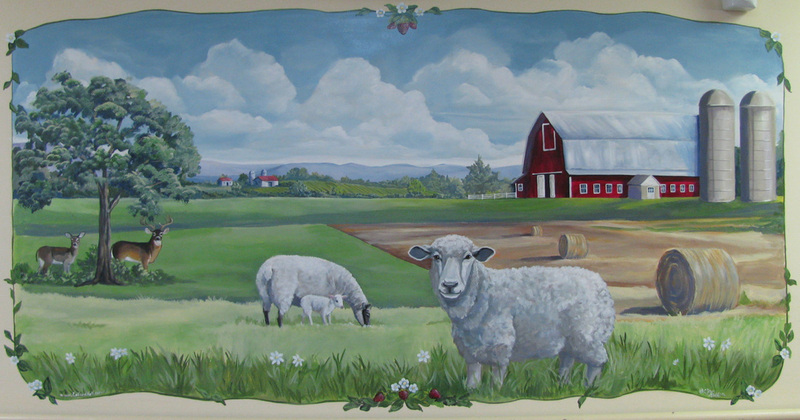 Since many of the residents were local, it was decided that pastoral Virginia farming scenes would help set the right tone and put them at ease. In order to disguise the safety door and keypad required in these kinds of Alzheimer's Units, Colleen painted the whole wall to look like a clapboard Virginia farmhouse porch, complete with ginger bread trim, planters with geraniums and even some old boots. 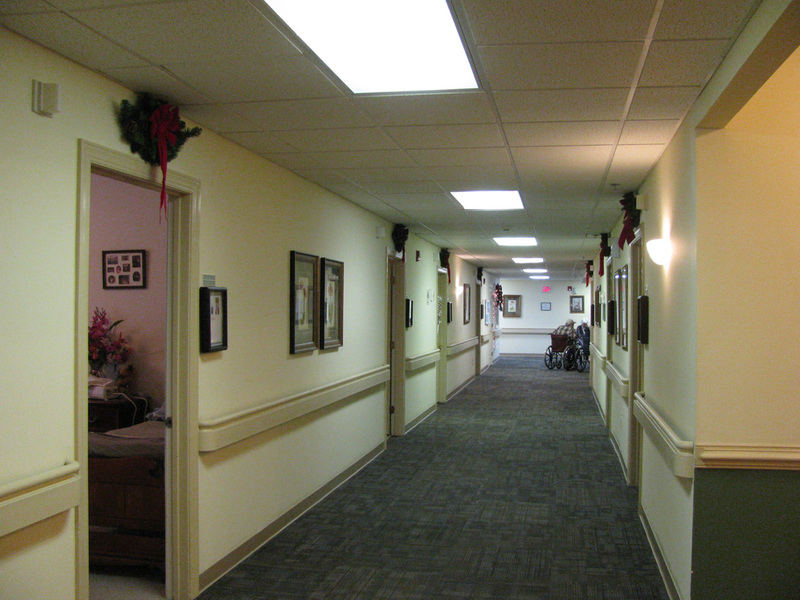 These visual cues set a tone and story that continues down the hall. 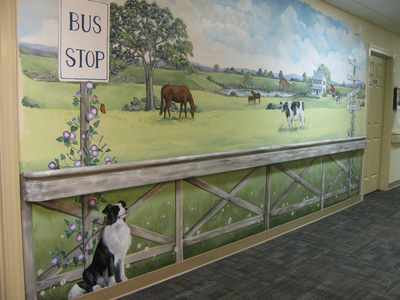 Animals always strike a chord with people, no matter the age, so a Border Collie awaits residents at the spot they meet up (the bus stop). Cows, horses and even a parade of chickens offer the residents something to put a smile on their face. Other scenes highlight silos, farm buildings, sheep and even local deer. 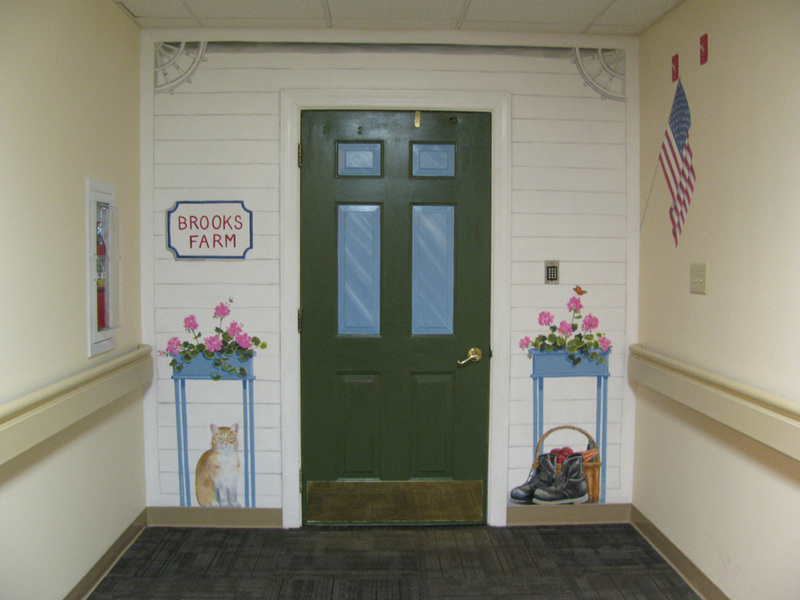 Little details like local flowers, bees, and ladybugs offer whimsical details that can provide items to seek and find for the residents. 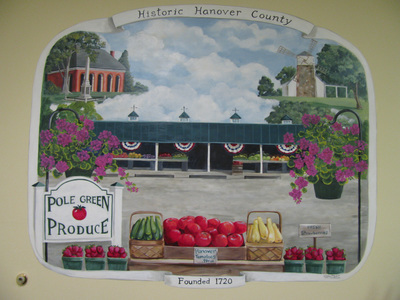 In the marketing office, a vignette features some of the historic buildings in this part of Hanover County also known for the farm stands featuring Hanover's famous tomatoes. 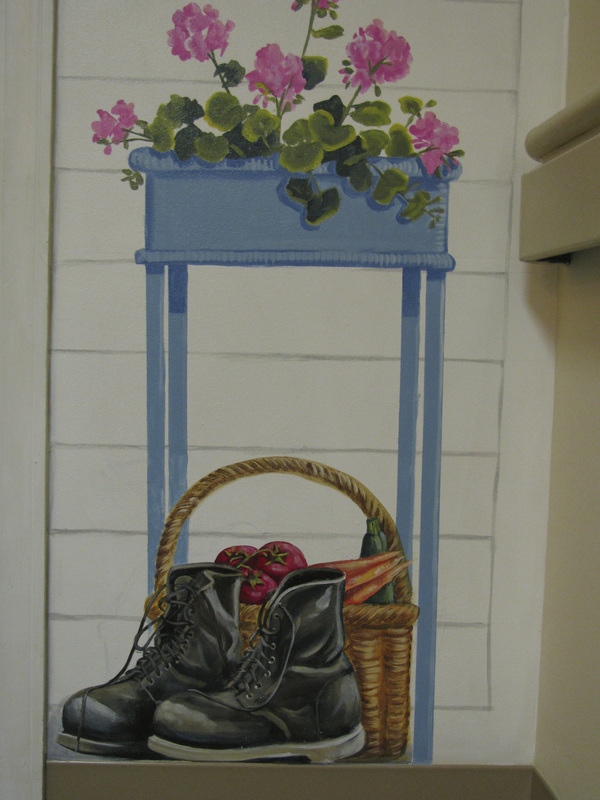 The client is always right in Colleen's book, although, sometimes it can be a bit of a creative challenge. 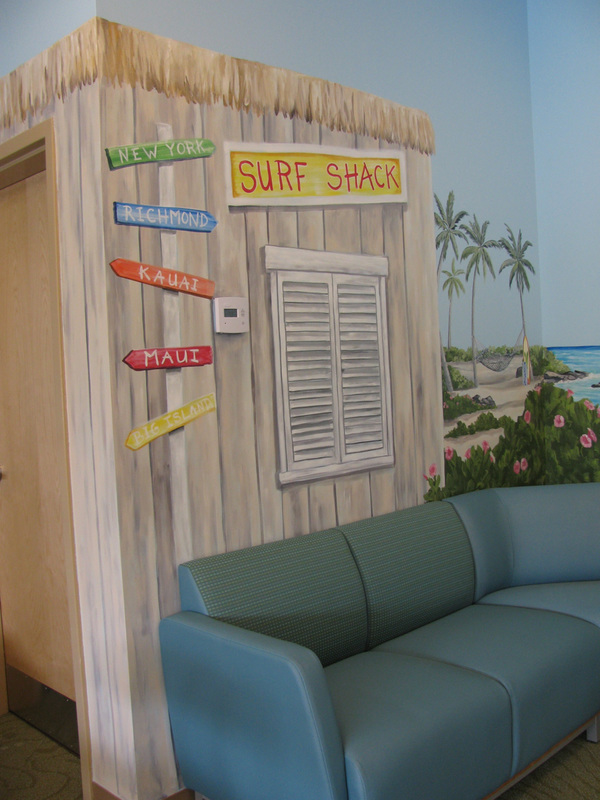 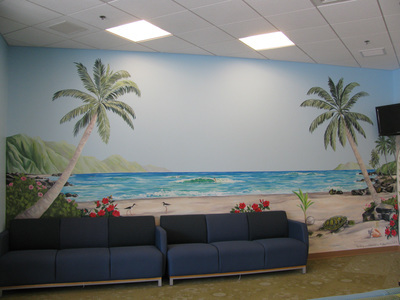 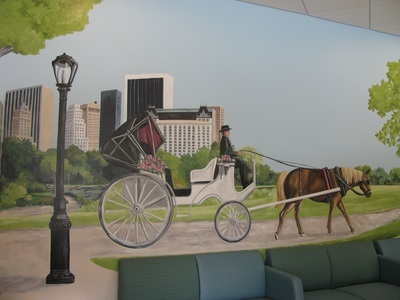 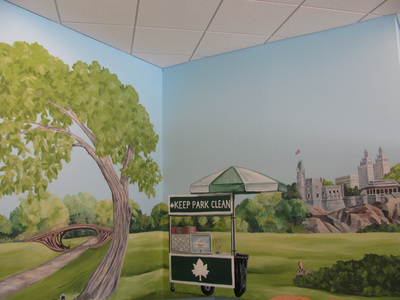 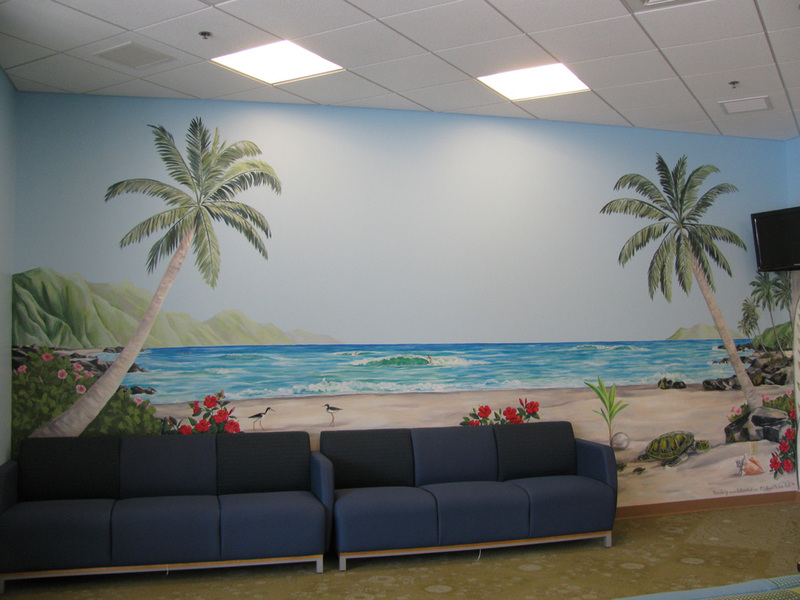 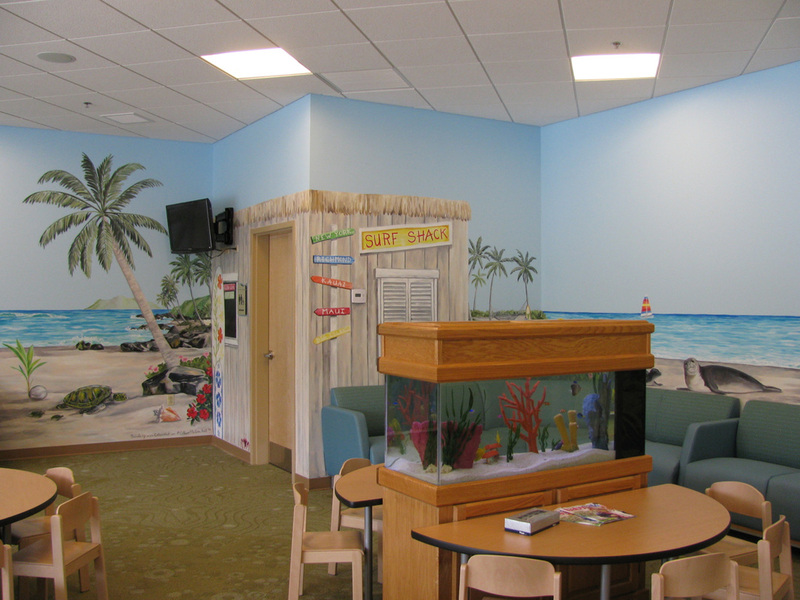 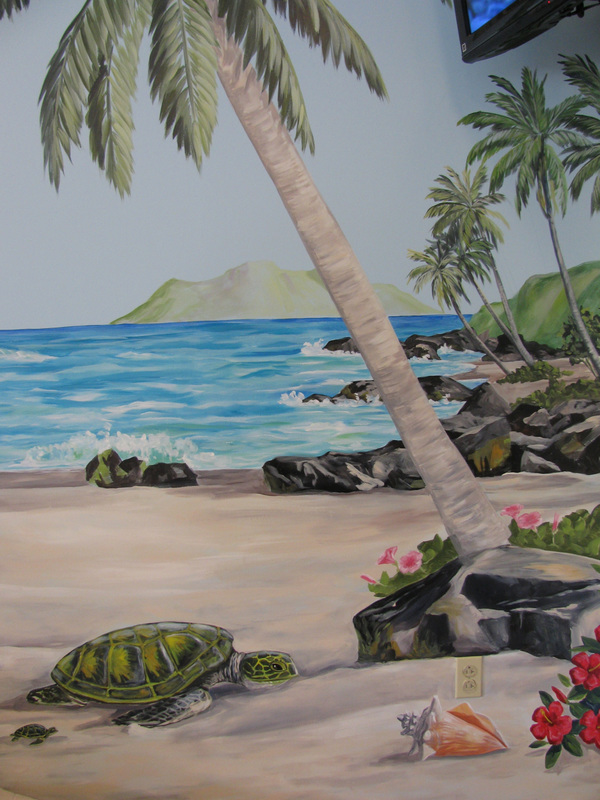 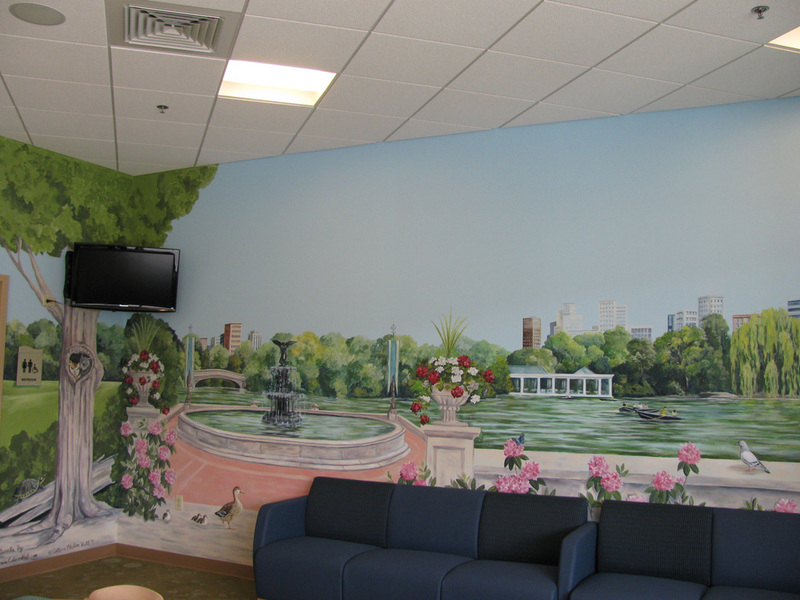 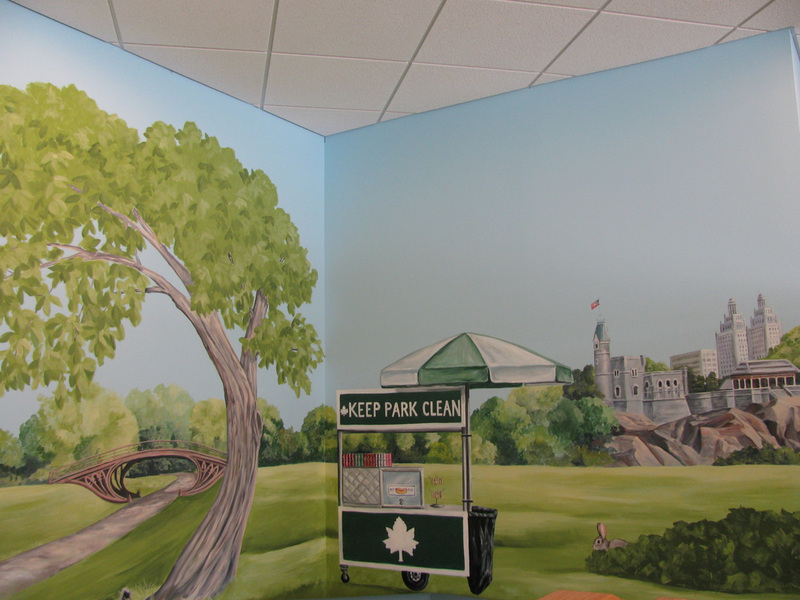 When designing her second office for a large Pediatric practice, Colleen was told the doctors had agreed on two themes for the waiting areas -half wanted a Central Park scene in New York City and the other half wanted a Hawaiian Beach scene. 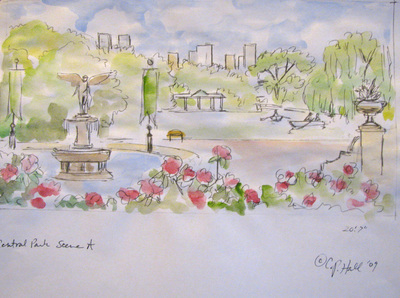 There was no budging on a unifying theme, so, Colleen decided to make it work by choosing a unifying palette of colors. 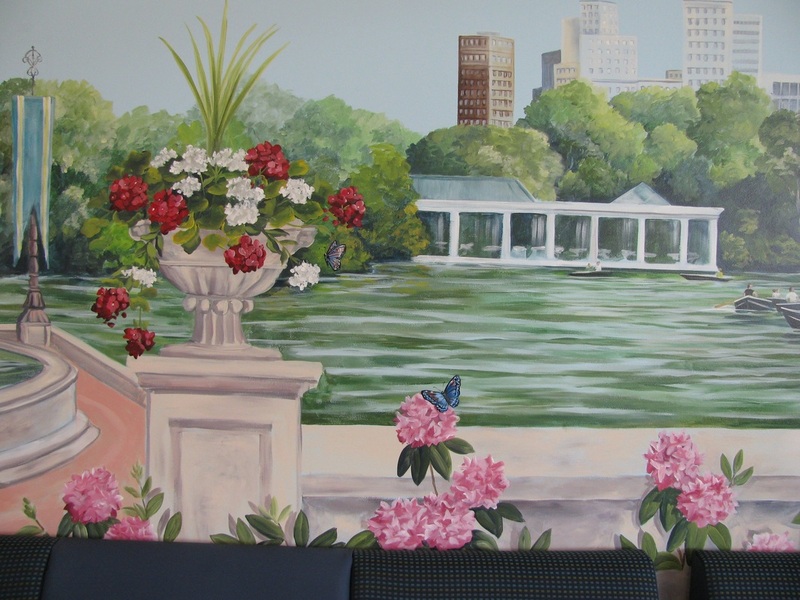 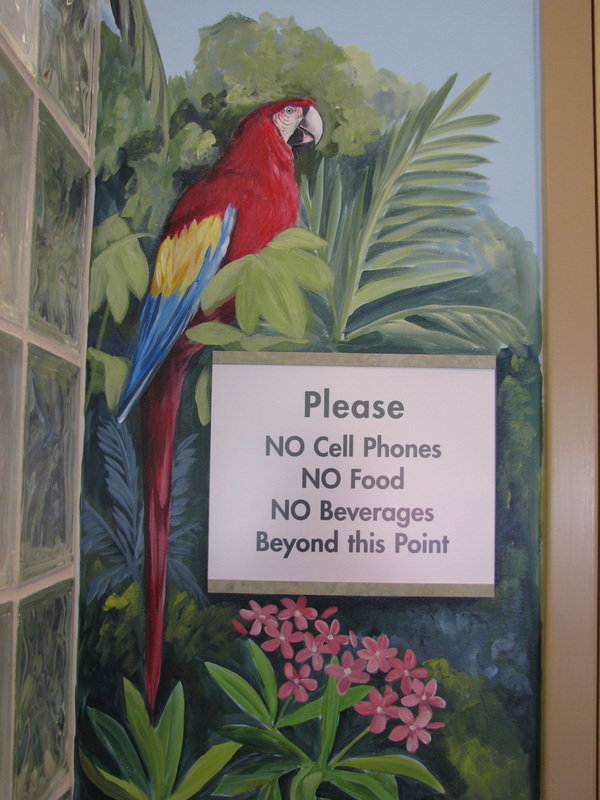 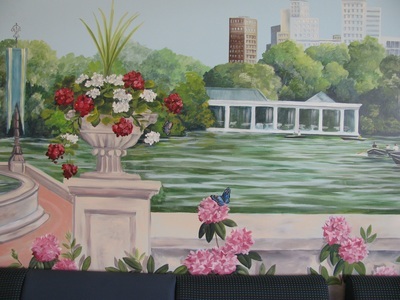 Patients needing the "sick" waiting area would be appropriately told to go to the beach side while the "well" patients got a visit to New York's famous park. Water was featured in each scene. 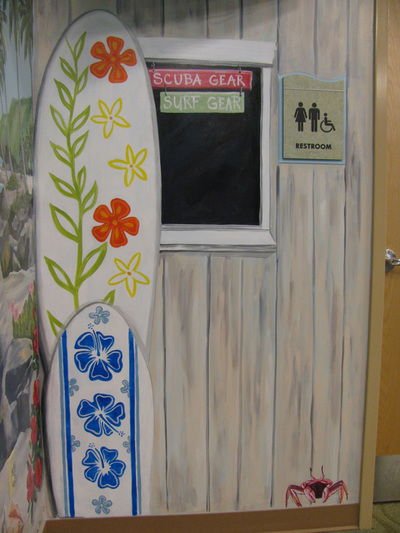 A surf shack cleverly disguised the bump out for the restroom. 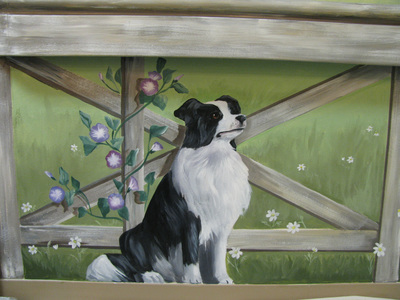 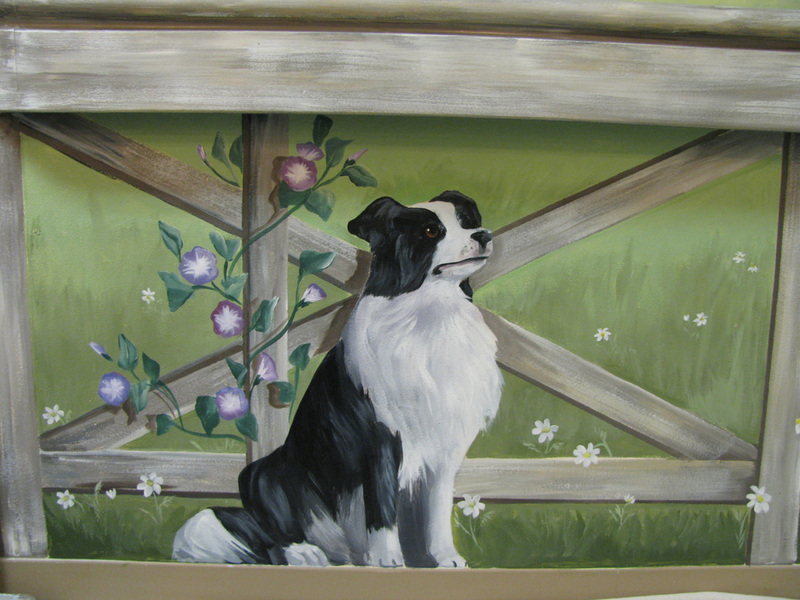 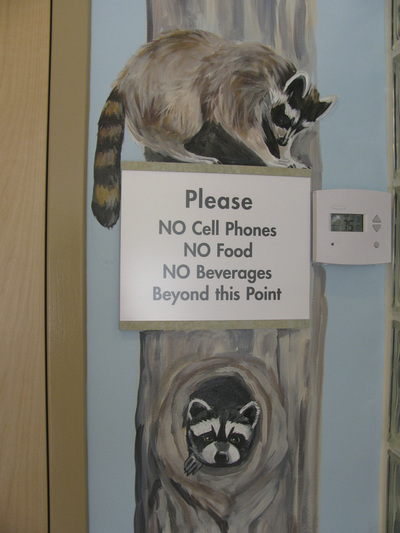 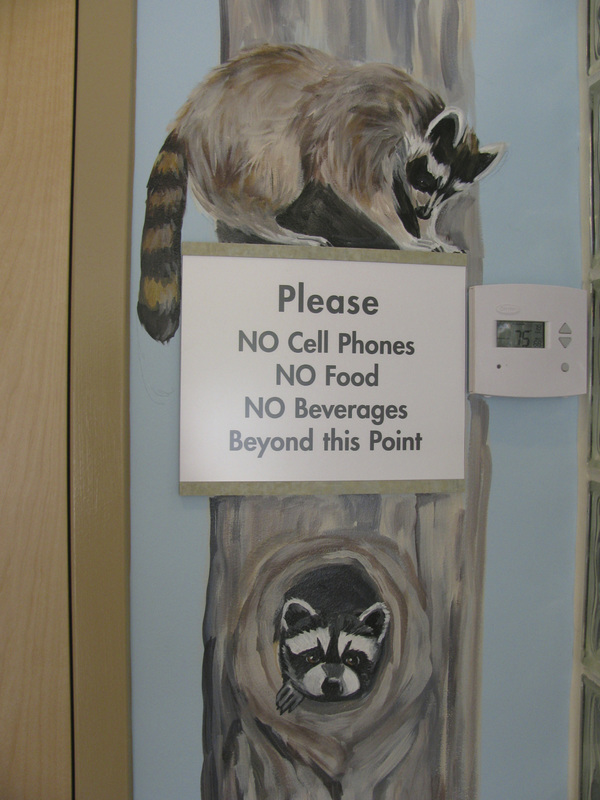 Of course, Colleen brought in the element she knew would appeal the most to parents, kids, and staff - animals. 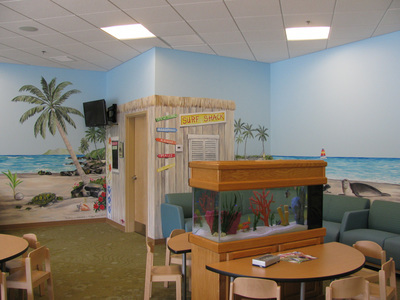 Her playful treatment of both areas help blend the area together in a way that is warmly welcoming.